Marvel is a leader in progressive refrigeration technology. 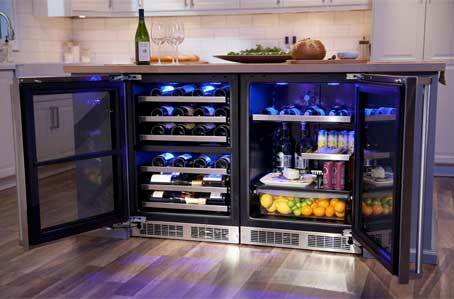 It makes a variety of different sized refrigerators, freezers, ice machines and beverage centers. They make models from small undercounter low profile freezers to full size built it french door refrigerators. Our company specializes in Marvel appliance repair and maintenance. We are number one specialists in everything related to Marvel. Our technicians are all factory trained and certified. If you Marvel appliance is broken or needs service just give us a call. We cover the whole process. We will diagnose what the problem is, order parts and expertly install them for you. You can be sure that after an appointment with us your Marvel appliance will be back in running order. Marvel is offering you appliances that are high quality, stylish, innovative and very energy efficient. Every year they come up with newer and more innovative models. We always stay on top of the latest in Marvel technology. We know every model from A to Z, and you can trust us with any complicated project. We order the best quality Marvel price at below market prices. We also offer a full 3 yearwarranty on all parts that we install. Besides excellent skills and knowledge, we also give you great customer service. Our technical team is highly professional, friendly and polite. They are always ready to help and to answer any question you might have. Also, we give you a accurate estimate and FREE service call with every repair job. Our scheduling is flexible, and we are available for appointment on weekends and in the afternoons. We will make sure that your service appointment is convenient for you. We are top appliance repair company serving Los Angeles, Ventura County, Marin County and East Bay. Our company has more than 30 years of experience doing both residential appliance repair and commercial appliance repair. There is not a brand or a model of kitchen or laundry appliance that we do not know how to fix. As long as we can find parts for your appliance we can fix it. We repair all major home appliances such as refrigerators, dishwashers, washers, dryers, stoves and ranges, ovens, steam ovens, microwaves, freezers, ice makers, BBQs, pizza ovens, patio heaters and much more. We offer top notch appliance repair service at very reasonable and fair price. Customer satisfaction is guaranteed! If you need professional Marvel appliance repair service give us a call or fill out our short contact form. We will schedule you for a service appointment at your convenience. Our technician will be on his way to your house. He will have all the tools, equipment and parts needed for your particular project. We usually preorder the parts to speed up the whole prosses. Once our tech gets to your house, he will get to work right away. He will do accurate diagnostics of your appliance and tell you about the action plan he has in mind. If he has appropriate parts with him, he will immediately start installing them. Otherwise, he will order parts, and you will be scheduled for another appointment as soon as possible. Whatever the issue is it will be speedily resolved by our specialist. After the job is complete, our technician will clean up after himself and dispose of all the old parts. He will plug in your appliance and make sure it is working great and is safe to use. Only then, will he turn it over to you. You will be happy to see that your broken appliance is working again. If you want your Marvel always to be well maintained, we offer annual or bi-annual maintenance program. It covers all appliances in your kitchen and laundry. As a part of this program, our technicians will do all the maintenance for you on a regular basis. They will inspect your appliances every time and catch any problems before they become significant. This maintenance service will save you time and money. Why choose us to do Marvel appliance repair for you? We have more than 30 years of experience repairing Marvel appliances as well as all the other brands. Our technicians are highly skilled, detail-oriented professionals who will do the best job possible for you. We will not waste your time but will preorder all the necessary parts for you and work fast to make your appliance functional again. Our team is factory certified and is always learning new Marvel appliance technology. Also, you get some of the best customer services around from people who are polite, friendly and want to help you. With us, you can be sure that your Marvel appliance is in good hands! Customer satisfaction is our number one goal! For Marvel appliance repair, please call us at 925-265-7782 in East Bay or 628-214-0064 in Marin County. Or you can fill out our short contact form. We would love to talk to you and answer all of your questions. Besides Marvel appliance repair are also certified to repair Asko, Bertazonni, Bosch, Dacor, DCS, Electrolux, Fisher&Paykel, Frigidaire, Jenn-Air, KitchenAid, Miele, Perlick, Samsung, Siemens, Sub-Zero, Thermador, Traulsen, True, Viking, Whirlpool, Wolf. Marvel is a leader in progressive refrigeration technology. It makes a variety of different sized refrigerators, freezers, ice machines and beverage centers. They make models from small undercount low profile freezers to full size built it french door refrigerators. Our company specializes in Marvel appliance repair and maintenance.